Assistant principal at California high school posts what is interpreted as an offensive tweet about an upcoming play on Anne Frank. An assistant principal at a high school in California has come under fire over a tweet he posted about an upcoming play on Anne Frank. Charles Mazet, assistant principal of discipline at the Palm Desert High School, tweeted "Who be hiding from the Nazis? Find out next week during the play" and "Who be Anne Frank?" on Thursday, according to a report in The Desert Sun newspaper. Student and Twitter user Mollie Biskar took a screen shot of Mazet's tweet and said, "Idk guys maybe we should drop the 'who be' joke when we're talking about the biggest genocide in history???" Mazet later replied and tweeted, "This tweet was not meant as a joke, just an attempt to promote Anne Frank. We need to remember the ugliness of Hitler's genocide." He told The Desert Sun he understands the sensitivity of the issue, adding he is Jewish by marriage. "By no means did I mean to offend anyone. I meant the opposite," Mazet stressed. "In part, I look at this because I am Jewish. This is something I have thought about and hiding from the Nazis is an important context in history." Biskar, a senior at the school, said however that it is never okay to joke about the Holocaust even on social media. "'Who be' is kind of a joke that he does. Everybody knows it's a joke, but when he does it about the Holocaust it makes the Holocaust a joke," she was quoted as having said. "And when administration is doing it, it makes kids think that it's OK to joke about the Holocaust." Biskar, who is Jewish and spent a semester in Israel, said while she was abroad she made a promise to herself to never let a Holocaust joke slide. "In Auschwitz there's a book of six million names of every recorded death in the Holocaust. It takes up an entire room, and I found 15 people directly related to me that died during the Holocaust," she said, according to The Desert Sun. "It hit home, and I thought about all of the family I could have had and all of the family my friends could have had and all of the people that could have been part of the Jewish community now." 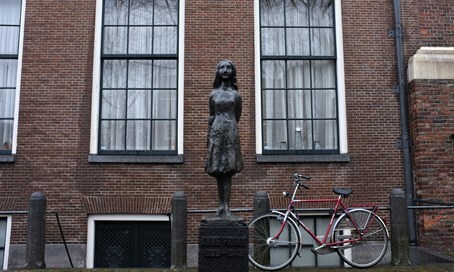 Anne Frank and her family hid from the Nazis between 1942 and 1944 before being caught and sent to a concentration camp. Frank died in the camp at the age of 15. Her diary, which she kept while in hiding, was published posthumously and has become the basis for many plays and films. It has been published in 60 languages and has also been released digitally as an interactive app.